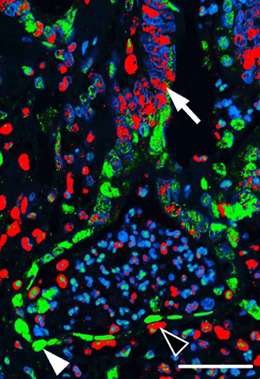 Human colon cancers contain two populations of cancer cells, one at the tumor edge in which the MAPK pathway is highly active (indicated by green staining and the white arrowhead), and one in the center of tumor in which the NOTCH pathway is activated (indicated by red staining and the white arrow).JEM 2018/Schmidt et al. Early-stage colon cancers can be surgically removed but later stages of the disease require more targeted treatments, including therapies designed to block a signaling pathway that promotes colon cancer progression. Eva Marina Schmidt at LMU and Professor David Horst (now Charité Berlin) have now discovered that colon cancers are often resistant to existing drug treatments because they are composed of two different cell types that can replace each other when one cell type is killed. The study, which is published in the Journal of Experimental Medicine, suggests that combination therapies targeting both cell types at once may be more effective at treating colorectal cancer, the third highest cause of cancer-related death.